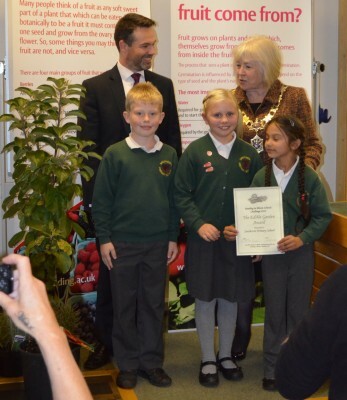 Overall winners of the Reading in Bloom Schools’ Challenge with the Mayor and Dr Mark Fellowes. On Wednesday 16th October the results of the Reading in Bloom Schools Challenge were announced at a ceremony hosted by the University of Reading. 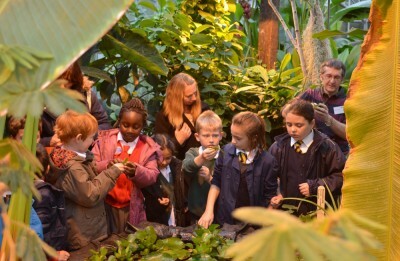 Eight of the ten winning schools attended a meeting that started with a tour of our recently refurbished Tropical Biodiversity Glasshouse. Prizes of Lavender plants, certificates and a cup were presented by Councillor Marian Livingston, The Right Worshipful the Mayor of Reading, and a family apple tree tree for the overall winners was presented by Dr Mark Fellowes, Head of the School of Biological Sciences. Ann Westgarth and her team had organised refreshments including apple juice produced at the National Fruit Collection, Brogdale, which is manged by the University of Reading, as well as biscuits and coffee for the teachers and helpers that attended. 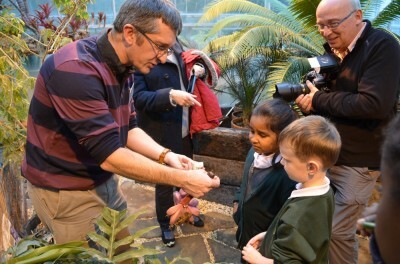 Alastair Culham demonstrating the pink banana fruit to pupils and the Reading Chronicle photographer. The glasshouse visit began with a short talk about the role of plants in providing oxygen, food, medicine and even inspiration for art and literature. Some plants also cause problems by become weeds, causing allergies or poisoning people and other animals.Throughout the greenhouse there is robust signage explaining the themes for plant groups and offering snippets of information about them. The school children were challenged to think about familiar foods and what plants they might come from. 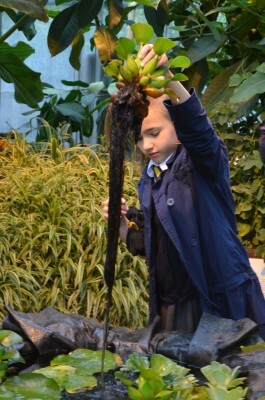 The centre of the glasshouse is dominated by a large banana plant – not currently in fruit – but pineapples, papaya, sweet potatoes, taro, rice and many other crops are also on display. The pink banana (Musa brachycarpa) is in full fruit and caused a lot of interest, not just because the fruit are pink and furry but the bananas have many hard black seeds inside! The large numbers of visitors caused us to run two tours of the glasshouse, a welcome spot of warmth on an otherwise cold and rainy day. 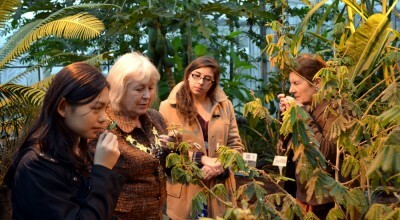 Our greenhouse is run as an educational resource primarily for University students, and visitors are offered the chance to touch and smell the plants, and even taste some of them. One of the plants with a truly wonderful warm and spicy smell is Guinea grains (Aframomum melegueta), which is native to Africa and used there to flavour cookery. Sadly it does not seem to have reached the UK as a popular spice. The long roots of water hyacinth are being inspected by one of the Schools’ Challenge winners. Some of the fun plants to play with in the greenhouse are the floating water plants that provide vital ecosystem services by cleaning up water, but can also be weeds that clog those waterways. The purple roots of the Water Hyacinth (Eichhornia crassipes) caused particular interest among some. 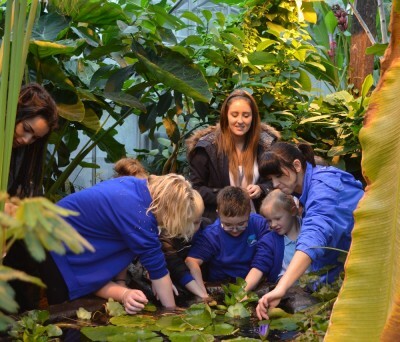 Can you sink the water plants – not for long! There was no doubt that the pond, attracted the greatest interest among visitors – especially the unsinkable plant species! The tours of the greenhouse entertained the school pupils, their helpers and the Mayor. All had interesting questions to ask and useful comments to make. Some pupils showed great prowess at identifying the food plant species they saw including pineapple, sugar cane, papaya and sweet potato. This glasshouse was refurbished with a grant from the University Annual Fund which paid for some of the infrastructure and for the excellent signage developed bt Reading University Typography students. Most of the hard work was done by undergraduates on the Biological Sciences BSc Degree course and the MSc in Plant Diversity. If you wish to arrange a school visit please contact Ann Westgarth who is able to advise on timings, and health and safety. More photos and details of the winners are available at Get Reading. This entry was posted in Hands-on, Learning and Teaching, People, Primary Schools, Public, School Visits, Secondary Schools and tagged All Saints Infants, Blagdon Nursery, Coley Park Primary, English Martyrs RC Primary, Reading Girls, Southcote Primary, St Anne’s Roman Catholic Primary, The Avenue. Bookmark the permalink.